– “Generally plastic tube of greater than 3/16″ ID is not recommended – it provides too much resistance for practical use!” I think you mean less than 3/16″. Resistance per foot increases as diameter decreases. – “A simple switch to 1/4″ ID vinyl tubing will get us there – looking at the same 12 psi keg system we get: L = (12-1)/0.85 = 12.9 feet. So with the smaller tubing we can deliver our beer to just under 13 feet.” I think you mean “with the larger tubing.” 1/4″ tubing is larger than 3/16″ tubing. Nice article, but what about 1/8″ line. I actually use it in my kegerator for soda. I am currently running my soda (and seltzer) at 30PSI @ 40F with a 4′ 1/8″ Vinyl Line. It yields a very nice pour and doesn’t leave a pile of line in my fridge. My brain must have been stuck in reverse when I wrote this – corrections made! I don’t know where everyone is getting these numbers. I’ve had a kegging system for 10 years and the math doesn’t match my experience at all. In reality, I get a full pint in about 9 seconds with minimal foaming. Shorter line lengths do not work – I will get nothing but foam. I can’t say what the difference is, but I’ve been reading this advice for years and it just doesn’t match my system at all. I’ve even used different kinds of plastic serving line and it didn’t make much of a difference. What about the pressure drop in the stainless tube in the corny keg, this is about 2 ft long and 1/4inch (3/16?) or so, i assume that would aslo add a few psi drop (for corny keg users). One final note, BYO mentioned a .5 psi drop for a picnic (cobra) style tap. What do you do if you need a longer line, and can’t afford stainless steel piping, 12 feet doesn’t sound like a lot. Say you have a beer cellar with your refrigerator system and a pub in the attic, you kick up the keg pressure I suppose? I have not done the math in metric, but it should be simply a matter of applying the right unit conversions first. You could use the unit converters in BeerSmith to do it. For very long lines you need to go to larger diameter tubing, which will have less line resistance. This is better than increasing keg pressure which would lead to improper carbonation for the beer, and subsequently poor carbonation at the tap. A secondary consideration with really long lines is the fact that you need to keep them clean and cool – as they could contain a significant volume of beer. Remember that we are talking about resistance… a resistance force can never be more than the force it is acting against. The bottom line: the longer the tube gets… the slower the beer flows until eventually it stops. According to the math I can’t get where I need to. I know I need larger tubing to get the balance, but I am having trouble finding figures for resistance in larger than 1/4″ polyethylene tubing. Where can I find this information? I don’t have a good number having never done larger than that – you might want to try a beverage supplier who might be able to help. Hi, I’m just wondering, will The system work without having the system ‘balanced’, with the line I’ve got and height etc it’d have to be about 20 feet long. Is there a way to work out the pressure I should pour at untill I can buy smaller line? also should I be turning the pressure back up (or down) to carbonating pressure once I have finished a drinking session? Try running the calculations with a different size line – you should be able to find one that works for your scenario. Hey, great article! If you REALLY want to get into the science behind draft beer, the formulas are a lot more complicated! It has to do with conservation of energy (Bernoulli’s Equaiton) and frictional losses (Darcie-Weisbach). It even changes with the SG of the beer! I’ve done a little writeup ( http://www.mikesoltys.com/2012/09/17/determining-proper-hose-length-for-your-kegerator/ ), and made an excel sheet in google docs ( https://docs.google.com/spreadsheet/ccc?key=0ApGb-vIKLq7FdGtzN3BrY2xZSldORzQ2bHVVX0hzaEE ) if you’re interested in checking it out. Realistically, this is just a more nerdy approach: the results are about the same. Do taps with flow control achieve exactly the same result as a longer pipe? I’m about to buy a direct to cornie tap, with flow control, and fear I’ll just pour foam. If you have flow control you can adjust the flow rate to match your desired carbonation level. Balancing the lines is still important, but you can probably set them a bit on the higher pressure side since you can adjust the valve on the tap to suit your preferences. Great article. I’m surprised that I haven’t seen any Jockey Boxers chime in yet. I’m currently using, and will be for a fall party, a jockey-box with my home-brewed Cony kegs. Lets tackle my main issue currently. I am using a 150′ coiled SS line to cool the beer as its served. Should I really be using 70 psi to serve my beer correctly? Second is, I am adding another coil to the box but its shorter? Is this not gonna work at all? I am finding conflicting information on what the correct resistance for 3/8″ od ss beer line is, and 3/8″ I’d vinyl line is. I have done a lot of research online and have came up with numbers from .09psi/ft to .2psi/ft for the SS and .1 to .3psi/ft for vinyl. These little differences turn into monumental differences when multiplying them by 100ft of tubing. How does this translate for Nitro systems? Euro taps with restrictor plates have a higher pour resistance, but I don’t know what that resistance is. Is there some way to measure the pour resistance of a restrictor plate tap? I have 5 feet of air line and 5 feet of 5/16″ beer line and get a lot of foam. I’ve been reading I need to make one of the lines longer but which one do I change out? I tried posting yesterday but it didn’t take. I have a refrigerator keg conversion kit with Lagunitas IPA inside. I am have 2 5 foot lines, 5/16″ for both the air and the beer. My beer comes out foamy. Some of the reading I have done says to lengthen one of the lines. Which line do I lengthen based on the formulas in this forum? I am trying to pump kegged coffee up to a tower faucet in my coffee shop from the first floor. Will nitrogen be sufficient when running pipes up one floor(8ft floor to ceiling), and horizontal to the tower faucet, about 25ft in total? Gotta admit – I’ve tried to run the numbers and they don’t match my experience at all and I can’t figure out why. I’ve got a kegerator with 5′ gas and beverage lines (pretty sure 3/16″, definitely poly). So, roughly 30″ corny height, then 5′ tubing (though there is slack, so the rise above the keg is only about 12″). I typically force carbonate with about 12 psi for a week, but once that is done, I serve with only 2-4 psi and get a nice head. What am I missing? This advice worked for me! Refurbished an older upright fridge kegerator…with my beer at 12 psi, 38-40F temp and lines that accompanied it (right at 3 ft, 3/16″ ID vinyl) I poured about half a pint of foam. I have about 6″ of vertical distance from keg top to tap inlets. So, I took the 3/8″ ID vinyl line from a picnic tap, measured it and cut at 4 feet…installed…and perfecto! Nice pour, a pint in about 10 seconds with a perfectly creamy 1/4″ head. Thanks for the advice! Correction…3/16″ ID picnic line – sorry about sloppy fingers. 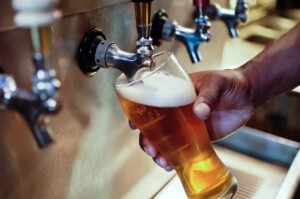 Served by your own tap is one the pleasure of draft beer. Volumes which is measured for the total amount of Carbon dioxide dissolved in the beer. It should be kept at standard temperature and pressure (STP – (32 F)). Hey, this is a great article – but i’m confused with the equation once you add in height. Your first equation – you say that your line should be 3.66 feet. But then your second equation – when the tower is actually up 2 feet, your line only has to be 3.33 feet. That sounds counter-intuitive to me, as you said for each foot in additional height you lose .5 PSI. Should the equation be : L = (keg_pressure – 1 PLUS (Height/2)) / Resistance ??? If so, that would give us L = (12-1+(2/2) / 3 = 4 feet. That makes more sense to me that you’d need a longer run if your tap is above your keg. Hi…in the above calculation you have considered 1 psi at tap…So is it so because here you assumed the keg to be at greater height than tap? Hi.. In the above calculation you considered 1 psi at tap. Is it so because keg is assumed at greater height than tap?